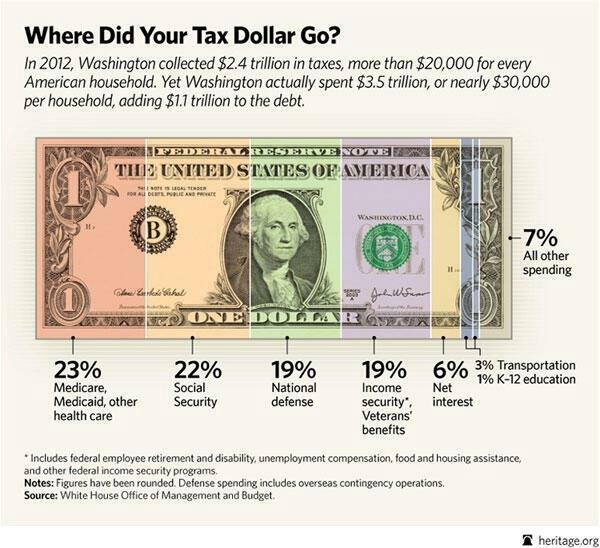 $10,000: that is how much the federal government spent per household more than what it received in tax revenue in 2012. $629: that is how much total government spending exceeded median household income in 2010. The total net worth of the Forbes 400, the richest people in America was reported in September of 2012 to be $1.7 trillion. Net worth is total assets minus total liabilities – this would include all property, stock, homes, personal possessions, etc. If the statists confiscated all of the net worth of Forbes 400, they would cover one year’s budget deficit and pay off 4.4% of our national debt or fund 0.8% of the estimated $86 trillion in unfunded liabilities. In fiscal 2010, according to numbers published by the Census Bureau and the Office of Management and Budget (OMB), net spending by all levels of government in the United States was $5,942,988,401,000. That equaled $50,074 for each one of the 118,682,000 households in the country. In that same year, according to the Census Bureau, the median household income was $49,445. That means total net government spending per household ($50,074) exceeded median household income (49,445) by $629. April 15, 2013 in Politics, Taxes. That’s a sad statistic. Taken by gunpoint or threats there of and if even 10% was used for good purposes I’d be surprised.